Every year on June 24th, Turin is crowded with thousands of people – not only from Turin but from other cities such as Florence and Genoa, where it is an annual public holiday. Its purpose is to honour the Feast of St. John (La Festa di San Giovanni). Shows, games, concerts, sport events and wonderful exhibitions take place, with people dressed in traditional costumes and spectacular fireworks over the River Po – this year watched by up to 200,000 in the city’s biggest square, Vittorio Veneto Square. As a 30-year-old rental company with a roster of top quality acts (Pavarotti, Sting) and events (Pellerossa Festival, JVC Newport Jazz) under its belt, Rinaldo Corsinotti is well qualified to make a judgement. Just as in previous years, the Turin sound rig was set up to provide coverage not only for Vittorio Veneto Square, but also Lungo Po Diaz, Lungo Po Cadorna and Murazzi. To achieve this, Corsinotti fielded 16 MLA Compact (in two hangs of eight) and eight of Martin Audio’s complementary DSX subs, which were ground-stacked in two rows, four stacks per row. There were also further delays and L/R side fills to throw the sound to Lungo Po Diaz. 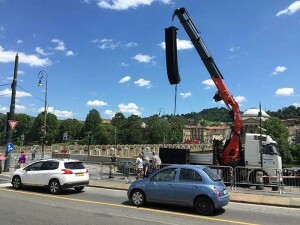 “The set-up of the venue was quite specific because the two control positions were connected – with the main one placed at Vittorio Veneto Square Gran Madre bridge and the second one installed on the opposite side of the river, about 1500 metres away. These two points were networked by specific radio connections and are used for the famous regatta challenge on the Po. 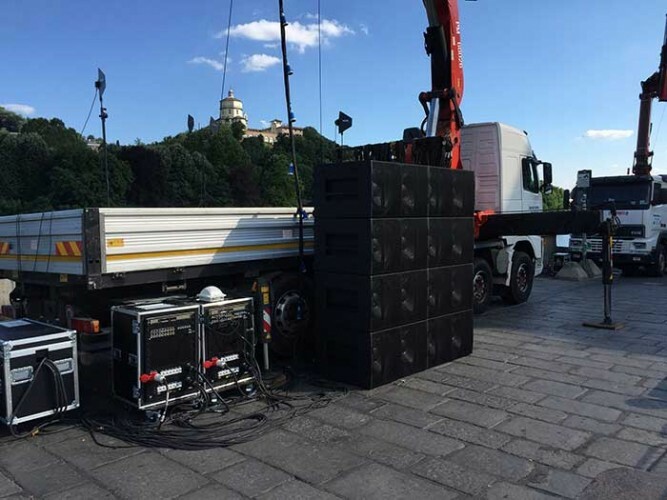 “Thanks to products as reliable, powerful and controllable as these, we were able to manage this important event to perfection – and to the great satisfaction of the entire production team,” declares Rinaldo, who was supported by a crew comprising Claudio Boggio, Andrea Nicola, Stefano Chiariello, Roberto Ferrari and Mirco Dal Ponte. The assembled multitudes expressed equal satisfaction. Many of them arrived at the square early in order to get the best seats and help build a movie style atmosphere. And while a number of local tribute bands and cover bands performed on a side stage, connected to the main stage’s MLA system, popular songs such as Yesterday and Let It Be by Beatles, Another Brick In The Wall by Pink Floyd and New York, New York by Liza Minnelli rang loud and clear into the night air through MLA.